➤ Upon arrival in Delhi, you will be met by our airport representative and transferred to hotel for check in. Overnight in Delhi. ➤ After an early breakfast transferred for domestic flight to Leh. Met on arrival at Kushok Bakula Rinpoche terminal Leh 3550m, and transfer to city hotel 5/10 min drive. ➤ On arrival at the hotel guest shall be received by traditional welcome scarf “khatag” welcome tea and then proceed to rooms. Full day at rest to acclimatize to the high altitudes of Ladakh region. ➤ Evening proceed on a Discovery Tour of Leh. Visit the formidable 16thcentury, Leh Palace the earstwhile seat of the Namgyal Dynasty of Ladakh followed by visit to the white pagoda “ shanti stupa” near changspa village which is a lovely vintage point to see how Leh looks like. Guest can have sometime at Leh main market and back to hotel. ➤ Lunch, Dinner & overnight stay at hotel. 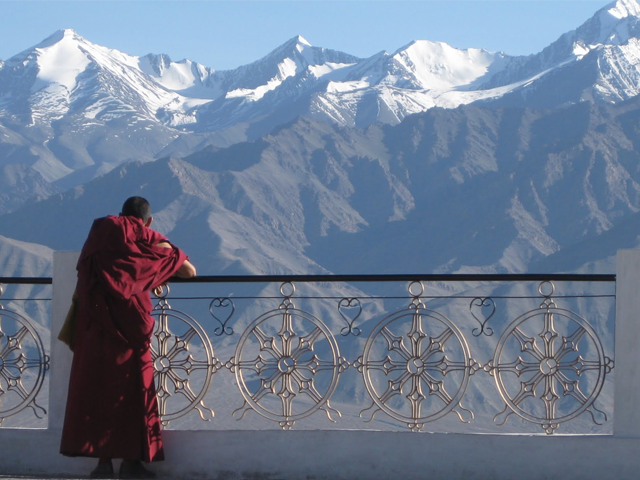 ➤ After breakfast proceed for a full day tour of Sham Valley Monasteries, which includes visit to the world famous Alchi Choskor monastery 65 km west of Leh known for its magnificent miniature Buddhist paintings (sumstek Lakhang is one of the main shrines containing amazing wall murals). ➤ Thereafter proceed to visit the Basgo Castle overlooking Basgo village, the giant Buddha statue at Likir Monastery and the monastery complex of Ridzong which is tucked inside a deep mountain valley off the ulleytokpo main highway. ➤ Evening back to Leh and free to explore the surroundings. ➤ All meals & overnight at the hotel. ➤ After an early breakfast proceed for a full day excursion to Pangong Lake, 135 km east of Leh crossing Changla pass 17500ft. ➤ Pangong is a frontier border area of eastern Ladakh with Tibetan region of China. 30% of the lake lies within Ladakh region and it’s an amazing crystal clear salt water lake at 4400ft fed by glacial water. Enjoy the lake area and back to Leh by evening. ➤ Today after breakfast drive east of Leh along Leh – Manali national highway through the lush green fertile belt of Shey Thiksey & Indus valley. ➤ Visit the Cave Monastery of Dhaktok in Sakti village approx. 58 kms from Leh, and later we cross Indus river at Kharoo bypass and visit Hemis Monastery complex. ➤ Thereafter we shall stop at Thiksey Monastery resembling something like the Potala Palace in Tibet, visit Chamba Lakhang which enshrines one of the most beautiful Maitreya Buddha statues, this shall be followed by visit the giant Shakyamuni Buddha statue at Stok village which was recently inaugurated by HH Dalai Lama. ➤ Thereafter proceed back to Leh by evening and free for personal activities. ➤ After breakfast transfer to airport to take flight for Delhi. ➤ Upon arrival transfer to restaurant for lunch. Afternoon free for Bazaar Shopping. ➤ Dinner will be provided at local restaurant then transfer to airport to take your return flight. ➤ p/s: Extension night stay possible at minimal cost.